Deep plum purple, light lavender, and white fabric on dress, princess sleeves, beautiful embroidered accents on the neckline and sleeves. Skirt has two colors: white and light lavender with matching flowers. Crystals throughout the dress, none missing. 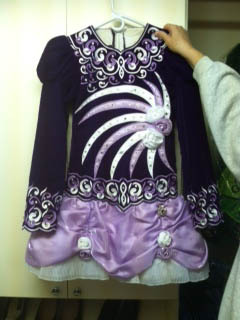 Snap on cape, comes with matching spankies, earrings, a number holder (sewn onto the dress), matching deep plum purple barrel style headband, and hairclip rosette flowers. Very strong stage presence, have had many compliments! 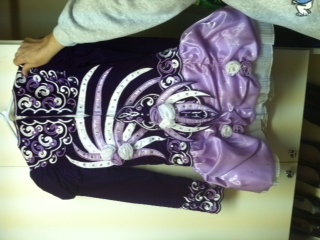 Original owners of this dress, has only been worn five times as the dancer has since retired. It comes from our non smoking home, very carefully cared for, excellent condition. 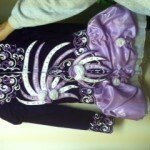 Will fit any dancer 5’3″ to 5’7″ unaltered, built in availability for alterations throughout the dress. $1000 US Dollars. I will pay shipping if in the US 48 states, you are responsible if outside this area. There is built-in availability for alterations throughout the dress. Asking Price: 1,000 US Dollars. Shipping costs are included for my own country, overseas shipping is extra. Sale is final.